That’s right, we’re still on a healthy kick! And it’s delicious! 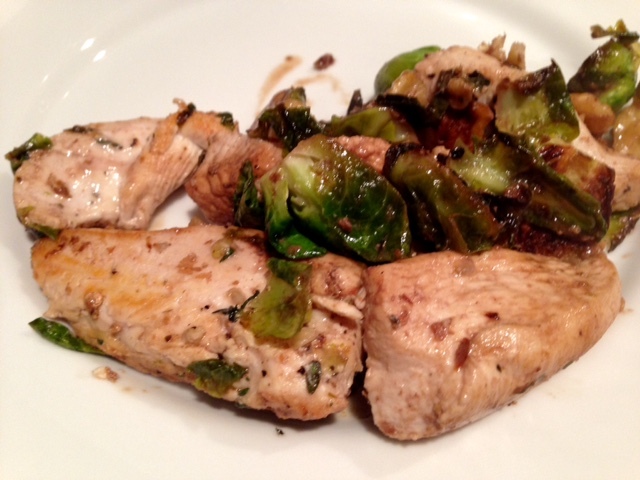 This recipe had been calling my name for a while, but getting decent brussels sprouts is kind of hard right now, and I also kind of avoid chicken when I can. Chicken’s kind of boring. 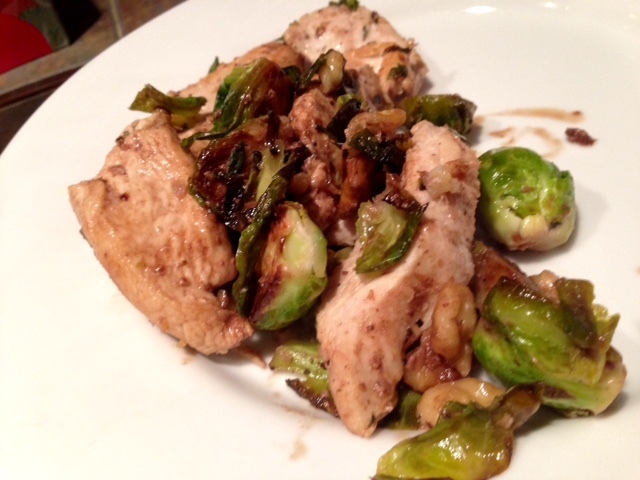 This chicken isn’t boring at all—it’s got a richness from the balsamic, a crunch from the walnuts, and serious fiber from brussels sprouts. It came together super fast and made for great work lunches for a few days. 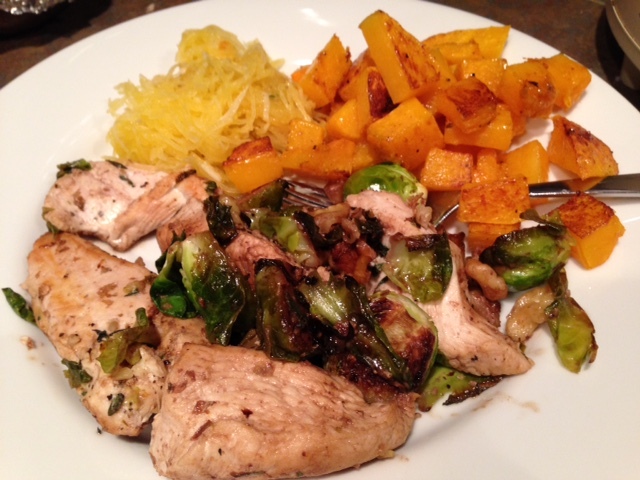 Throw in a side of spaghetti squash and butternut squash and you’re on healthy overload! Seriously, the whole thing is a 20-minute meal, was super easy, and totally delicious! Heat a large skillet over medium-high heat. 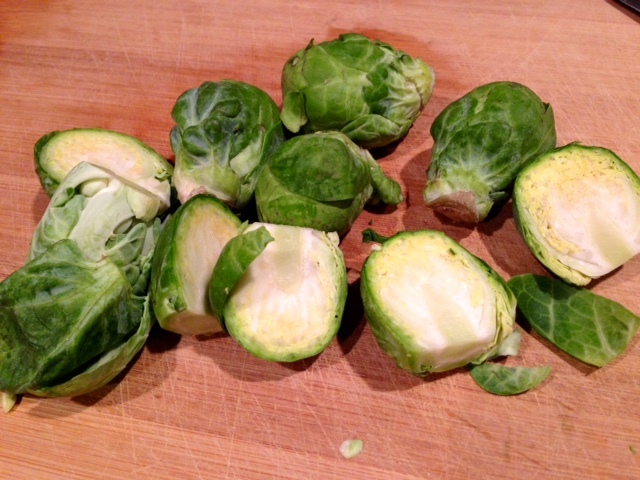 When it’s hot, add the olive oil, then the sprouts, cut-side down. 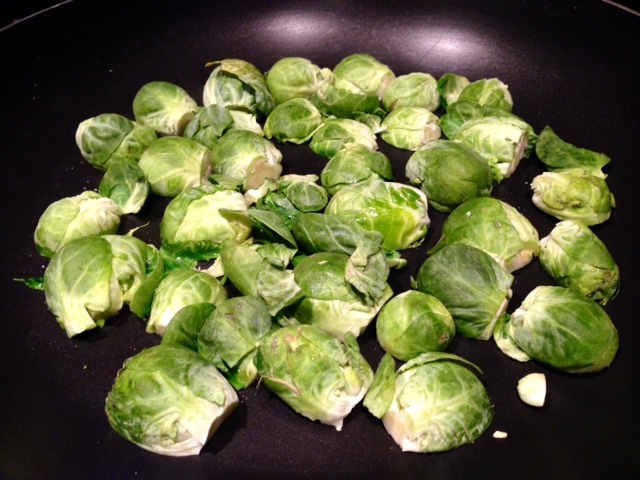 Allow them to cook for several minutes until they’re well-browned (it may take less if they’re smaller sprouts). Then flip and cook on the other side for a few minutes. 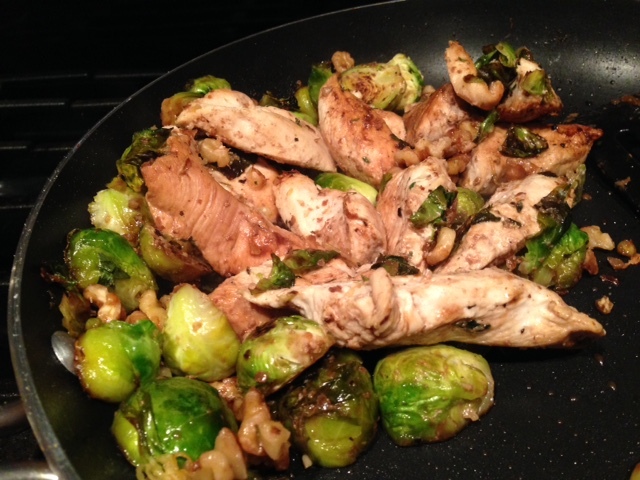 Add the chicken to the pan and season with salt and pepper. Cook until the chicken is well browned on both sides, then0 add the thyme. Continue cooking until the chicken is cooked through. Add the balsamic vinegar and walnuts, and cook for a few more minutes, until the vinegar is reduced and walnuts are toasted. Serve hot, but this also makes great (if possibly a bit dry) leftovers! Heat a large sauté pan over medium-high heat. 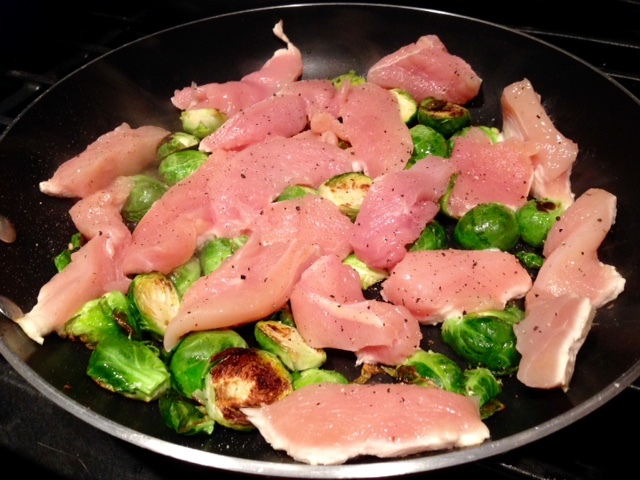 When it’s hot, add the olive oil, then add the sprouts, cut-side down. Allow them to cook for several minutes (it may take less), until they’re well browned. Then flip and cook on the other side for a few minutes. Add the chicken to the pan, and season with salt and pepper. Stir and cook until the chicken is well browned on both sides, and add the thyme. 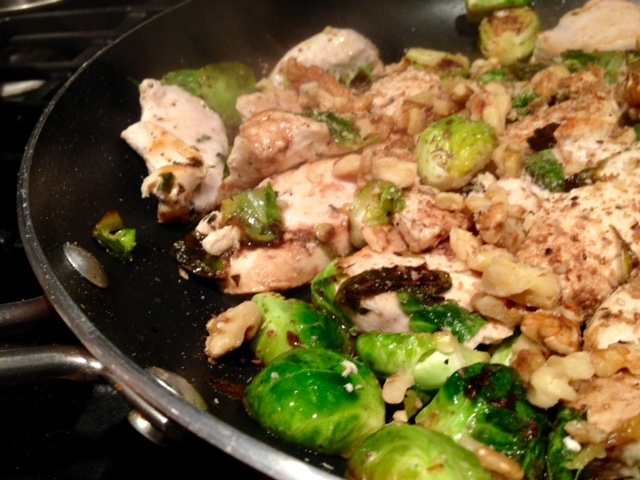 Continue cooking until the chicken is cooked through, then add the balsamic vinegar and walnuts. Cook for a few more minutes, until the vinegar is reduced and walnuts are toasted.